One of my friends reminded me that I had not blogged a film review recently. She said she enjoyed the filter through my eyes of the fall release of grown-up films She was right so here go my thoughts of a story told four times in film history starting in 1937 and continuing in 1954, 1976 and 2018. A Star is Born. . . . . 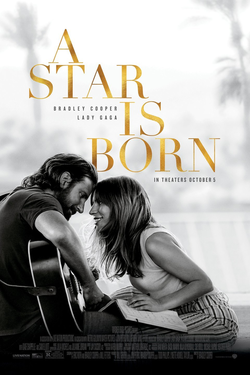 Many big themes fill the screen for 135 minutes with love being the all encompassing, love and music,love and ambition, love and honesty, love and vulnerability. With birth comes pain and the film doesn’t shy away from that . . . the pain that comes with life and self- destruction and addiction. The music is theater filling. Bradley Cooper spent 18 months learning to play the guitar and reaching the proper tone in his voice. He is very convincing and there is Lady Gaga. . . . . her voice , her music, her acting. . . A Star Is Born. . . . . I remember the Streisand/Kristofferson film from 1976 and will watch it again with new eyes. Cooper is also the director and a fine job he did. Very interesting that in the credits Lady Gaga was given star billing over Bradley Cooper and it is her first film. It is now 24 hours since I saw the 2018 moving remake and the music and different details are fresh in my mind. I feel vulnerable from experiencing the vulnerability of this film. Enough said. . . . . This entry was posted in film, music, piano, Rock'n'Roll, Uncategorized, USA and tagged A Star Is Born, blog, blogging, Bradley Cooper, Hollywood, Lady Gaga, welcome. Bookmark the permalink.